One of the coolest events Random Acts does each year is the Annual Melee of Kindness (AMOK). I’ve done it twice myself, and this year was even cooler than the last! So I bet you’re wondering what a photo of Times Square is doing on my blog. No, sadly, I wasn’t in NYC to take that photo. But a number of Random Acts staffers and supporters–including musician Justin Guarini!–made a big splash in the Big Apple, gathering food and supplies for needy animals, and having a great time. The fun continued a few months later during the Endure4Kindness event (E4K). This time, the Random Acts team offered video tours of the city via Periscope, in exchange for donations! Here’s mine (warning: it’s long…also, peacocks). 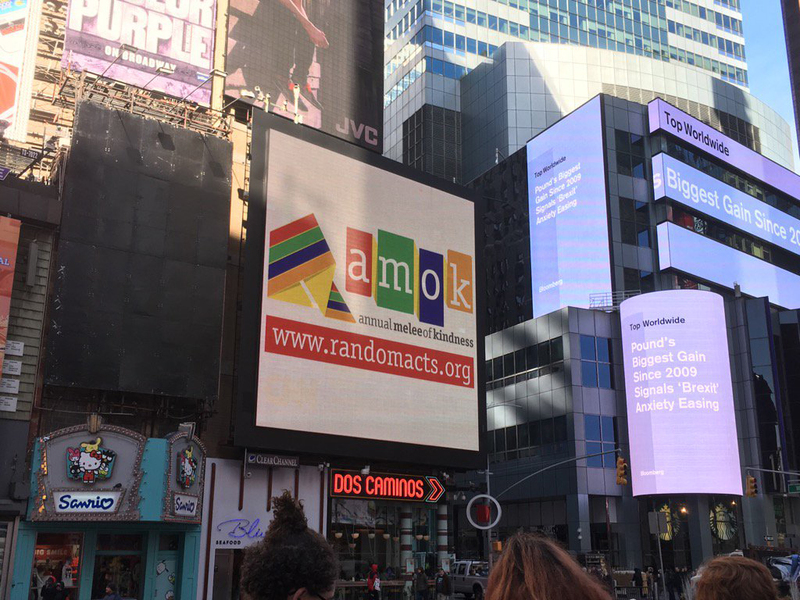 The great thing about Random Acts is that crazy and fun events like this happen all over the world–not just in major cities like NYC. You can get a glimpse of some of the random goings-on over at their Kindness Files! Previous Post Previous post: Regressing, or Progressing? Next Post Next post: Only Random Acts Could Get Me To Try My First 5K!